The orishá live in Bahia, Brasil. They are alive and well. This is especially evident in Salvador, the state capital of Bahia. Depictions of the orishá (orixás alt. spelling), are found in the various ruas (streets) and plazas of Salvador, Bahia, Brasil. They are literally visible throughout the city. The Orishá are the deities of the Afro-Brazilian religion Candomble. 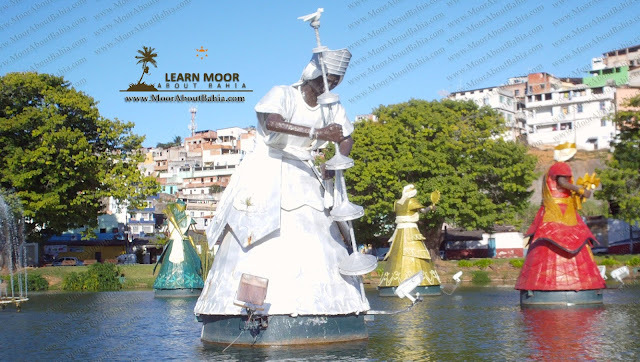 One example is the painted mermaid statue in the neighborhood of Rio Vermelho associated with Yemanja, mother goddess figure, which overlooks the sea. Another example is the statue of Exu, the orishá who manages all types of communication and guardian of the crossroads, which is located, fittingly, in front of Salvador’s central correiro (post office). One of the most impressive depictions of the orishá, however, is located on a big lake and recreation park in the middle of the city called Dique do Tororo, which contains a group of orishá statues dancing in a circle on the surface of the water. Dique do Tororo looks just as impressive as it sounds. Throughout this article you will see photos taken by my wife while visiting Dique do Tororo with a friend. 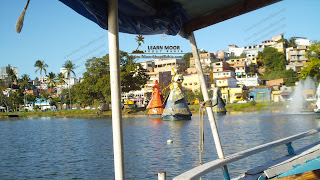 She took a boat tour that is available daily for only $20 reais. We definitely recommend the boat tour for anyone visiting Bahia, Brasil. Be sure to check out our Bahia Tour site to schedule any tours in Bahia. 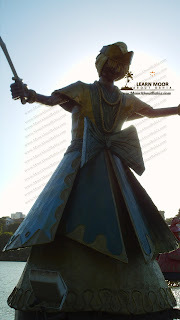 First let’s talk a little about "The Most African City of Brazil", Salvador, Bahia. The African presence is clear and unmistakable in Salvador, where a large portion of the population is of Afro-Brazilian descent. Bahian cuisine, centered around ingredients like palm oil, okra, and black-eyed peas, fit right in with West African culture. The dominant popular music has African rhythms as well. 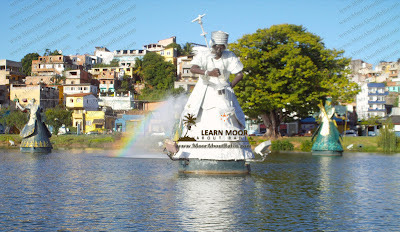 Candomble is often held up as a representation of the synchronization of Africa in Bahia because of its strong influences from West African traditions. In 2001 there was a State Board of Culture and Tourism sponsored billboard campaign that referred to Salvador as "Black City: The Most African City of Brazil". This campaign addresses the reality that Bahia, Brasil’s distinctive "African" identity does a great job at selling Bahia to tourists from other parts of Brazil and out of the country. Another principal method to attract national and international tourists to Bahia was the merging of a universalized form of Candomble into the rotation of festivals endorsed by the state and local governments. This helped to provide Candomble with prominence and perceived authenticity in mainstream society (Crowley 1984, Crowley and Ross 1981, Dantas 1988, Graden 2006, Lopes 2004:856, Pinho 2006, Santos 1998, 2000, Selka 2005, 2007, Shukla 1998, Van der Port 2005, 2007). It should be mentioned that the acceptance of Candomble, the Afro-Brazilian martial art Capoeira, and other cultural traditions classified by mainstream culture as "African" is fairly recent in the history of Bahia. Many Baianos/Baianas take pride in Salvador's African-Brazilian identity. Several Baianos describe their city as more "exotic" and "African" than the cosmopolitan areas to the south, in particular the metropolises of Rio de Janeiro and Sao Paulo. 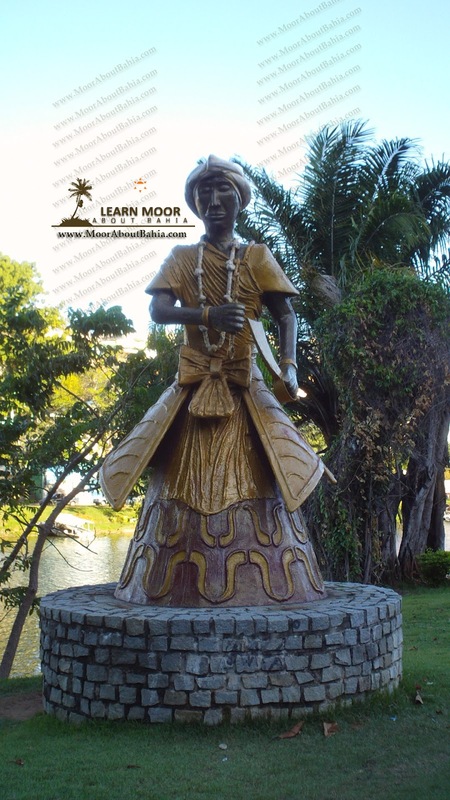 For followers of Candomble Dique do Tororo (Dike of Tororo) is one of the residences of Oxum (Oshun), orishá of fresh water, lakes, and fountains. In one tradition, during the month of December several female practitioners of Candomble visit the holy lake at Dique do Tororo to deposit baskets of gifts and flowers in honor of the Orishá (Orixás). Practiotioners of Candomble who are the children of the Orishá Ogum visit Dique do Tororo on Tuesdays to make their prayers and offerings. To pay homage to this sacred site the city commissioned the plastic sculptor Tati Moreno to create sculptures of the major deities of Candomble. Eight of the Orishá statues at Dique do Tororo are inside of water in a circle. They are as follows: Oxala (the father of all deities), Iemanjá (goddess the sea and mother of deities), Oxum (goddess of rivers, lakes and fountains), Ogum (god of iron and war), Oxóssi (god of forests and hunting), Shango (god of thunder and lightning), Nana (the oldest of the deities) and Iansã (the goddess of war and storms). The Orishá (Orixás) Candomble statues are in a wheel position similar to the one of the Filhos-de-santo (sons of the saint) in terraces (houses) of Candomble. At the center of the wheel is a water fountain with a blast of 40 meters in height. Only a century ago, the Afro-Brazilian religion of Candomble was a veiled secret in Bahia, Brasil and its capital city, Salvador. How time has changed things. Nowadays, the secret religion shrouded in mystery is accepted as a relevant part of local history, cultural pride, and now it has its own monument and park (Dique do Tororo). 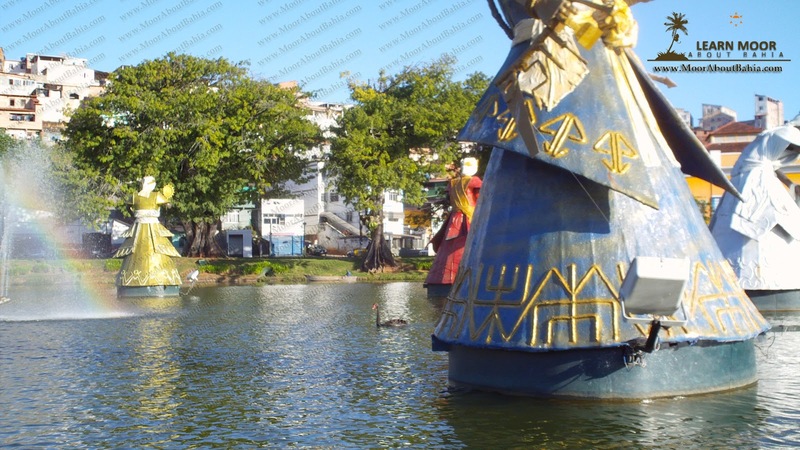 Eight giant statues of orixás, the deities of Candomble, were dedicated in the Dique do Tororo, a lake in the center of downtown Salvador. 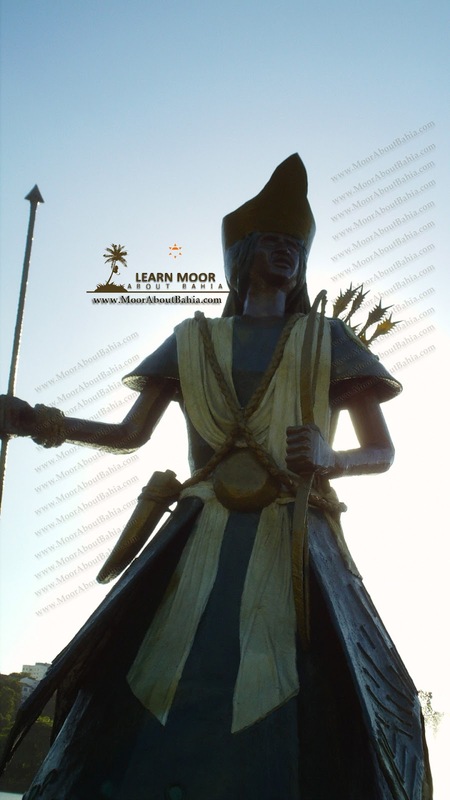 The Orishá statues, by the sculptor Tatti Moreno, weigh 2 tons each and are more than 22 feet tall. The Orishá sculptures are constructed of fiberglass over iron frameworks. In the evening the Orishá statues are illuminated and look as if they are hovering above the water in a circle dancing around a lighted fountain. These monuments were made to honor Brazil's African heritage, which is strongest felt in the state of Bahia. Candomble is the Brazilian relative of Santeria in the Spanish-speaking Caribbean and Voodoo in Haiti. Candomble is a New World tradition and rebirth of the Yoruba religion that arrived in the Americas with African slaves. Brazil was the main importer of slaves in the Americas when Salvador, with its superior natural port, was Brazil's capital and foremost trading center under the Portuguese empire. The descendants of those African slaves make Bahia the state with Brazil's greatest percentage of Afro-Brazilians. The orixás do Candomblé (orishás of Candomble) are worshiped as mighty, impulsive beings, all with their own aspects. The Orishá are linked with specific colors, specific occupations, several natural phenomena, and certain days of the week. In the course of Candomble ceremonies, drumming and incantation help transport devotees into a trance where they are possessed by the spirit of an Orishá. These same rhythms and traditional drumming have trickled into Brazilian popular music. 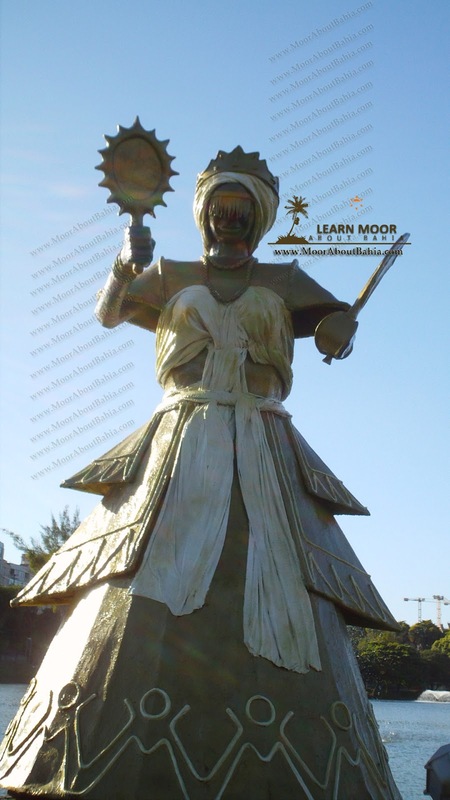 Colonial overseers unsuccessfully tried to eradicate Candomble, which survived, by continuing to worship the African deities in the guise of Christian saints in a similar manner to the way Santeria and Voodoo were carried on throughout the Caribbean. An example is the veneration of the Virgin Mary, for instance, who is equated with Iemanja (Yemaya), the goddess of the sea, who also wears white. Another example is the aged Omolu who is matched to Lazarus. In the early 20th century, the Candomble ceremonies were still subjected to police raids. It was not until 1976 that Candomble practitioners were able to carry on without 1st obtaining permits from the police vice squad. In Salvador a city that has churches all over the place, it is estimated to have at least double the amount of Candomble houses as it does churches. Brasil is 90 percent Roman Catholic. In Bahia, Brasil many of the faithful attend both Catholic Mass and Candomble ceremonies. A long time ago Candomble followers chose the lake at Dique do Tororo as a sacred site for Oxum (Oshun), the goddess who rules lakes. On a worldly level, the lake has lately been salvaged by the city from years of pollution and negligence. 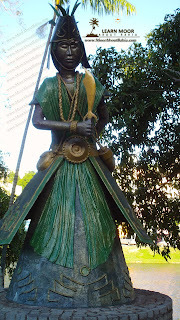 The orishá statues are part of a rehabilitation that includes landscaping and playgrounds around the lake's perimeter. From the shore, the orishás (orixás) appear to be females wearing long dresses. They are actually male and female deities wearing African robes. It's well worth taking a short boat trip or bringing along binoculars for a closer look. 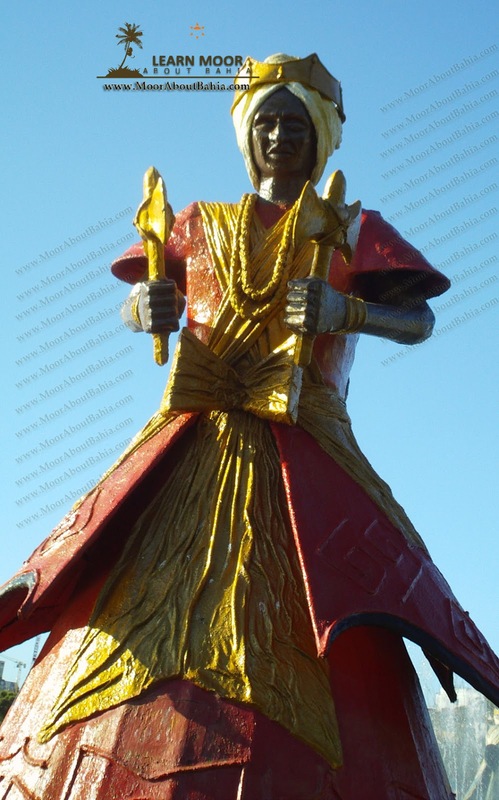 The Orishá Statues at Dique Do Tororo have intricately designed robes and crowns decorated in their traditional colors. Each Orishá carries the symbols of their godhood. 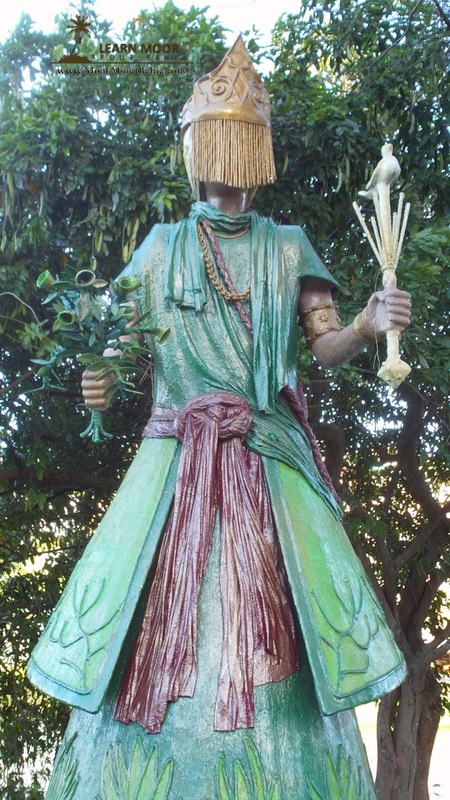 For example Ogum (Ogun), the patron of people who work with their hands, carries a saw, hammer, and drill while Xango (Shango), the deity of fire, thunder, and drums, holds a two-bladed axe. 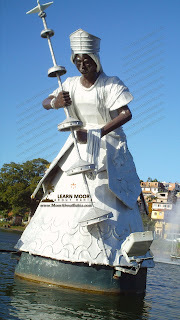 The orishás (orixás) faces are black, brown and tan, and their features are African, Indian and European, reflecting the mixture of worshipers that the sculptor, Mr. Moreno sees at Candomble services. As a mixture of public and religious art, the Orishá statues at Dique do Tororo involved a certain amount of diplomacy. A Protestant evangelical church, which had planned to purchase a building on the lake shore, protested the possibility of having African deities on its doorstep. 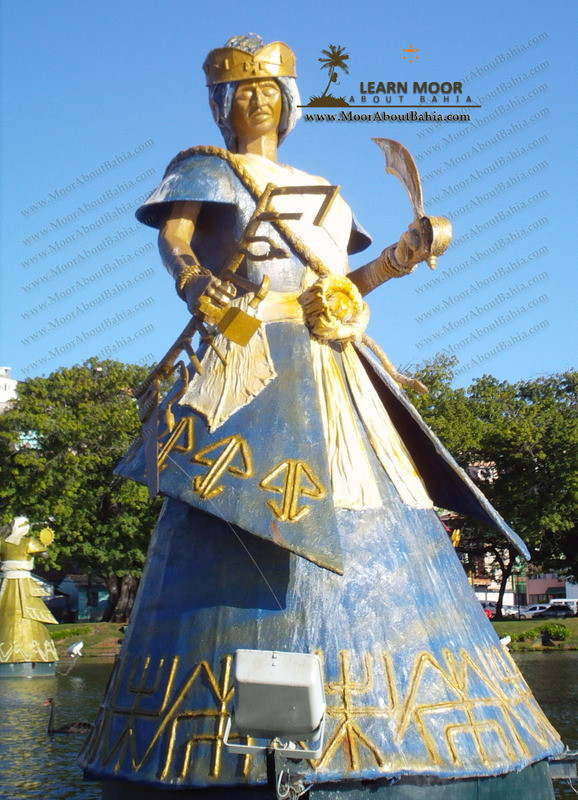 Ultimately, the Orishas (orixás)won out as the church agreed to move to another location. Eight orishás command the lake at Dique do Tororo. 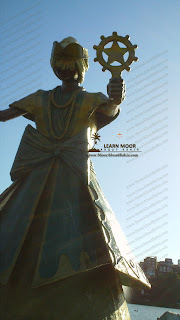 This is an incredible site to behold, a monument to African gods in Bahia, Brasil. 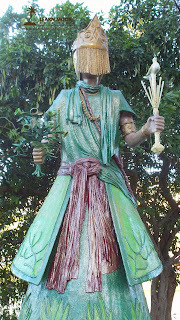 Four remaining deities in the pantheon, whose attributes inhibit them from living on the water, have been created to stand in other sites around Salvador. The divine messenger. Also known as the trickster. Dominion: Rules the beneficial and detrimental forces of the universe. Father of the orishás. The great orishá. Dominion: Procreation, creative force of nature, death, peace. Colors: White, marble, gold. Symbols: Shepherd's staff, shells, gold, lead Dance: Unclear. Mother of the Fish. Dominion: Water, mothers, wives, families. Colors: Light milky blue, light pink, white. Symbols: Silver cutlass, star, a round silver fan with an etched figure of a mermaid. Dance: Soft movements of the hands, as if parting the waters. God of War, god of demands. Dominion: War, vengeance, sculpture. defender of law, agriculture and surgery. Colors: Dark blue, red and white. Symbols: Crossed swords, scalpel, sickle, breadfruit tree. Dance: Stabbing the air with a sword. Named for an African river. Dominion: femininity, charity, the womb, middle depths of the sea. Colors: Gold, yellow, blue. Symbols: Mirror, dagger. Dance: Like a woman taking a bath in the river, Or sensually combing her hair. God of Lightening and Justice. Dominion: Law, justice, tempests, knowledge. Colors: Red, brown, white and purple. Symbols: Double-bladed ax, thunder and lightening bolts, javelin. Dance: Clenched fists boxing each other. The thunder mother, goddess of the storm and vengeance. 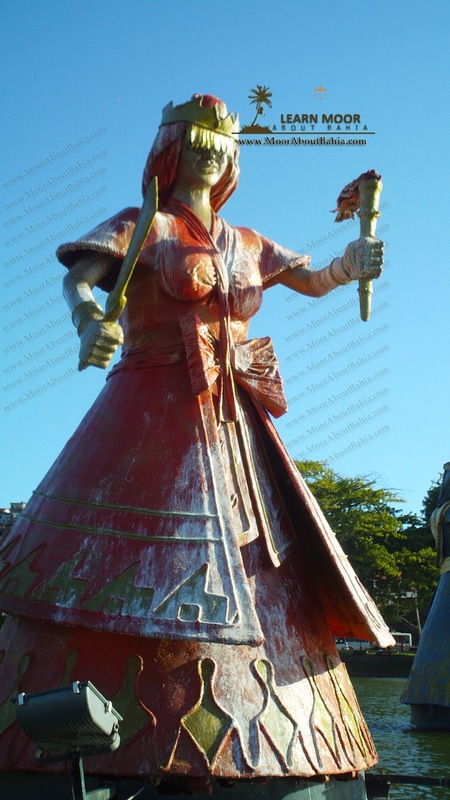 Wife of Shango. Dominion: Wind, tempests, vengeance and spirits of the dead. Colors: Coral, yellow, red, brown and white. Symbols: A horse tail whip, cutlass, copper chalice and thunder bolts. Dance: one hand on the waist, the other trembling in the wind. Mother of the Orishás. Dominion: The portal of death, the deep sea, ruins and deep wells. Colors: White, dark blue, purple. Symbols: Broom, cowrie shells and ribbons. Dance: Curved over a cane and moving like an old woman. octor of the Poor. Dominion: illness, cemeteries, sickbeds. Colors: Scarlet, yellow, black, gray. Symbols: A miniature iron lance, two thick wooden clubs. Dance: Curved over a cane like an old man. God of the Forest and the Hunt. Dominion: Hunting, forest, cultivation, the law of Christ. Colors: Green and yellow, green and white, light blue. Symbols: Wooden bow and arrow, miniature rifle, fig tree, leather hat or crown with feathers. 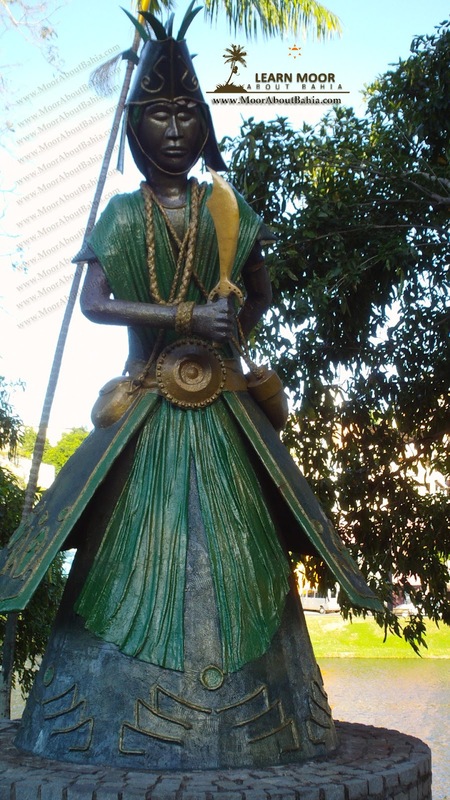 Heather Shirey's article, "Transforming the Orixás. 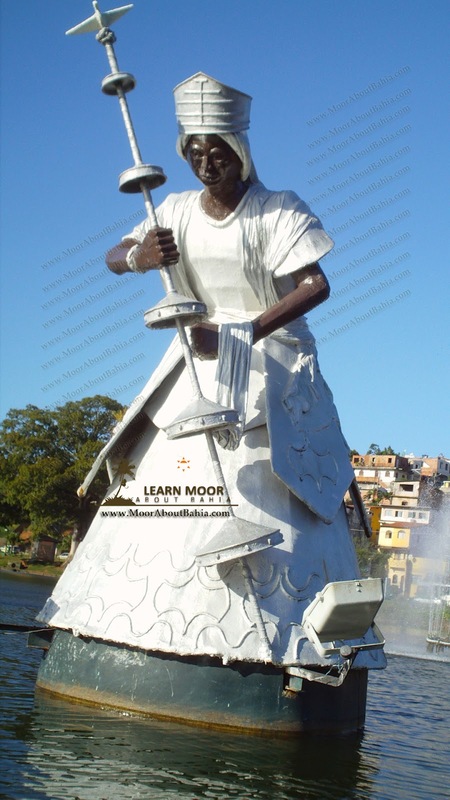 Candomblé in Sacred and Secular Spaces in Salvador da Bahia, Brazil," was published in the winter 2009 issue of African Arts (volume 42.4, 62-79). For information, go to http://www.mitpressjournals.org/toc/afar/42/4. I'm Nigerian man, from south west of the country. I was born to family of traditionalists and muslims, my parents and their parents practiced traditional but still have muslim names and celebrated muslim festivals and have muslim names too. All these made to know more about the both religions, my late mother was one of Ogboni Reformed Franternity member, while my dad is an Ifa-priest. My maternal grandfather during his life time was a great hunter, herbalist and farmer, also my aunty is a sango priest. She celebrates her sango ceremony/ritual nite annually. For me, am into art and craft business with one of my uncles, he has a customers in brazil from Sau Paulo to Rio De Janeiro, that are Nigerian and West African ancestry. But he wouldn't like to travel to brazil, but ever since i read on wikipedia and the potential and investment opportunities in Brazil and in Bahia most especially, i had been doing research on african connection in bahia. I will like to know, if i can find a ready-market for my goods like wooden-carving such as Sango (xango), Esu (exu), Osun(oxum), Ogun (ogum), Obatala, Yemoja (iemanja) and other dieties...... I knew one of his customer from sao paulo, a yoruba man, that married to white brazilian-woman and they are practicing and worshipping ifa together. I was really surprised when i saw a white with amulents on her arms and incisions all over her body. Just let me know if i can make it, i f i can bring my goods/market to brazil to sell. Put me through the proceedures i will follow and i will need to. You can reply me through my mail @akinlabi_abideen@yahoo.com or my facebook ID @ Abideen Akinbode. Thanks so much for reading my message. I love this your blog, so much. Keep it up......... BRAVO!!! Douglas-Velez Administracao De Bens Ltda. Powered by Blogger.